Table top and bench seats are made entirely of water impervious 2" x 4" recycled plastic Resinwood. 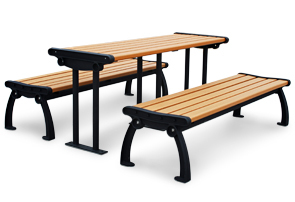 Bench legs are constructed of heavy-duty cast aluminum and table legs are made with strong structural steel. Bench and table frames are powder-coated in your choice of black or green. Table is supported with a third base to eliminate the risk of sagging. Bench and table frames include 1/2" holes for surface mounting. Heavy-Duty zinc coated hardware included. Your choice of table top/seat and frame colors shown below. Set includes one table and two benches.